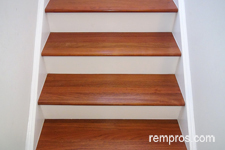 Brazilian cherry vs white oak hardwood on stairs – comparison chart. Which wood is better for stairs? Brazilian cherry is reddish to dark brown wood. Grayish to light brown with distinctive grains wood. It is harder to work with Jatoba wood compare to oak. Even though, white oak chips and splits, it is much sorter wood compare to Brazilian cherry what makes it easier to work with. With a time, especially under direct sunlight, cherry hardwood steps might change in color dramatically. Changes in color are less noticeable. Brazilian cherry is extremely durable wood. Over 100 years with adequate installation and proper maintenance. Red oak floors can easily last 90 + years. Solid steps 1 in. thick, hardwood planks or strips. Prefinished or unfinished solid steps and stair risers, white oak strips or planks. Greatly vary. Exotic wood including Brazilian cherry is more expensive compare to white oak. Significantly vary. White oak is cheaper hardwood flooring in comparison with Brazilian cherry. Type of stairs, size and overall work complexity affect installation expenses at a first place, but wood species play insignificant impact on labor cost determination. Installation of 10 – 12 solid prefinished Brazilian cherry steps on 36” wide stairs typically is a one day project for an experienced hardwood installer excluding any preparation work. Normally professional hardwood installer is able to install 11 – 14 solid prefinished white oak steps and stair risers on up to 42” wide stairs in one day. Building custom wood stairs or staining and finishing wood on-site might take a few days to complete the project. 1 Rating was estimated on the scale from 1 to 5, accounting 1 as lowest and 5 as the highest quality of a product. Always consider the fact: not all products made equally the same and performing of particular flooring material installed on stairs significantly depend on individual product quality, adequate installation and proper maintenance. 2 Hardness of wood rated on a Janka scale. It is a parameter which indicates resistance of wood to impacts. Higher number means harder the wood is. 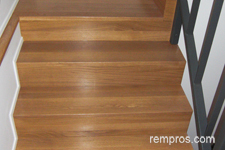 Brazilian cherry and white oak are both great hardwood options for installation on stairs. Jatoba is much harder wood, but it is more expensive. With its unique reddish look Brazilian cherry is already colorful wood without stain application. White oak is cheaper, lighter in color, but could be easily stained in any desired color. With proper installation and adequate care both hardwoods are long lasting materials and could be refinished a few times during its lifespan. There is no straight answer to the question “which wood is better?” Often it is just a matter of a taste and budget set which hardwood to purchase for stairs.